The letter was sent Tuesday, the day the PLUM committee held a second public hearing on a revised citywide sign ordinance that has provoked widespread community opposition, in part because of provisions that could have allowed advertising signs in parks. Before the committee voted to send the ordinance back to the planning department for further refinement, member Jose Huizar said he wanted to make sure that no mechanism or loophole existed to allow park advertising. 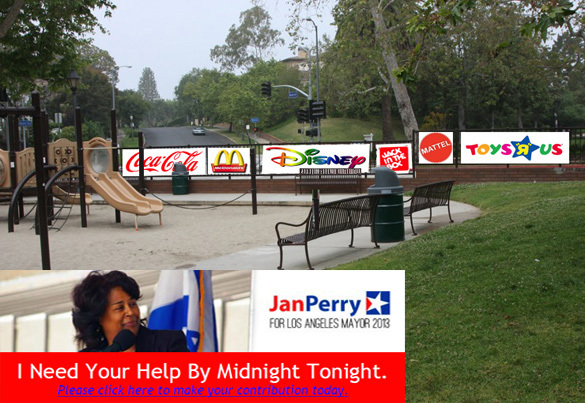 In her letter, Perry also urges committee members to severely reduce the required size of special sign districts that can allow new billboards and other kinds of off-site signage not allowed elsewhere in the city. The minimum size requirement–15 acres or 5,000 ft. of street frontage–was adopted by the City Planning Commission (CPC) for the expressed purpose of avoiding “one-project” sign districts because they wouldn’t constitute true “districts” and could be legally problematic. Despite this, lobbyists for development and business interests have repeatedly criticized the minimum size as too restrictive, and Perry’s letter calls for a minimum street frontage of 2,640 ft. for a sign district. As a matter of comparison, that’s approximately equal to the street frontage of L.A. City Hall. What she means by “left behind” is uncertain, since the Wilshire Grand sign district, which will allow more than 30,000 sq. ft. of digital off-site advertising, is just a few blocks from L.A. Live with its large collection of static and animated signs, and the L.A. Convention Center/Farmers Field area where massive amounts of new signage have been proposed. The sign ordinance approved by the CPC and now pending before the PLUM committee in a revised form limits sign districts to the downtown area and other regions in the city zoned regional center and regional commercial. There is currently no such region in South Los Angeles, so the only way a sign district could be established there would be through rezoning and alteration of the city’s General Plan. Finally, Perry says in her letter that the current draft of the sign ordinance “takes a confusing position” on the grandfathering of the 14 pending applications for sign districts in regard to sign reduction credits and community benefits. While she doesn’t specify what is confusing about the provision, the ordinance adopted by the CPC required a more than one-to-one takedown of existing billboards in exchange for the right to put up new off-site signs in sign districts. However, lobbyists have pushed to allow a “community benefits package” with items like sidewalk widening and facade improvements as an alternative to the billboard takedown. Weakening of the takedown provision has been vigorously opposed by community groups throughout the city.